At the end of this article, you will find a video showing this scenario. I realized this scenario on SmartCloud Application Workload Service but of course it is applicable to IWD or PureSystems. To setup your development environment, please follow this article. – The pattern type will contains only 1 server. – The server will have one parameter. 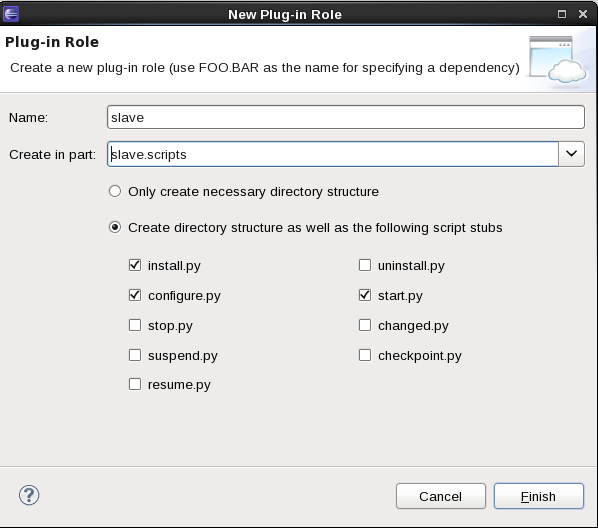 – The deployment process will log a message when the ‘deployment’ starts the installation. – The deployment process will log a message at another point of the deployment. – A pattern-type is generally composed of one plugin composing the ‘pattern-type’ definition and one or more plugin composing functionality provided by this pattern-type. If we take as example the ‘Hello’ sample provided by the article above, the ‘pattern-type’ is ‘patterntype.hello’ and we have three plugins hello, hcenter and hlink. The number of plugin is based on an architecture choice. – We can decomposed a plugin in two main parts: The application-model which defines the different components and links to design a virtual application pattern and the physical-model which defines the different virtual machines and scripts that have to be launched on the target cloud. Two mechanisms are provided to map the application-model to the physical model, one based on java code and the other on templates. The preferred and recommended one is the template but if your deployment is more complex you can use the java mechanism or better a mix of template/java by realizing simple operations in the template and more complex operations using java. In this article I will use only the template and I think at 99% the template is enough. The template is transformed at run-time into Java code using Apache Velocity, that’s mean in your template you can use Velocity macro to provide directive to the transformation process. 1) create a new workspace. 2) Create a new pattern-type using the wizard provided by the PDK. ‘New’->’IBM Workload Pattern Type Project’ and enter the following information: then click ‘Finish’. 3) create a new pattern plugin project using again the PDK wizard. ‘New’ -> ‘Project’ -> ‘IBM Workload Plug-in Project’ and enter the following information. Don’t pay attention for the time being at the packages element. I have defined the component name, label, description and I specify that this component have one required string attribute called ‘attr1′ initialized with the string “str”. We have to import from the PDK example the ‘plugin.com.ibm.sample.hellocenter/plugin/appmodel/images’ directory in order to import the images. After having designed the application-model in the metadata.json, I’m ready to test it. 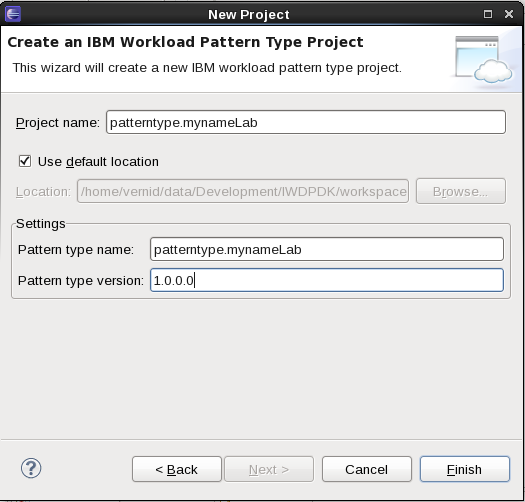 1) Again the PDK wizard will be very helpful: Select the pattern-type project, right-click and select ‘IBM Workload Plugin’ -> ‘Build’. 2) Open you SCAWS portal, select ‘Cloud’->’PatternTypes’. 3) Click on the green ‘plus’ and select the *.tgz located in the patterntype.mydemo/export directory. 4) Once uploaded you have to enable the plugins, this can be done by selecting the plugin in the right panel and selecting ‘enable’. 5) Click on ‘Patterns’->’Virtual Applications’ and click ‘plus’, select ‘patterntype.mynameLab’ and ‘Start Building’ a new pattern and you can see you have the component, drag and drop it in the editor area and you will see the attribute. Put a value in the ‘Attribute1′ and save it. The physical-model is composed of a vm template file defining the virtual element that should be deployed and their role regarding the application model. We have also to create an OSGI component to convert this template to a topology. The PDK will create at the same time the OSGI Component, the template and update the MANIFEST.MF. We can see I defined an attribute ‘Attr1′ for this virtual element. The attribute is initialized with the ‘slaveAttr1′ defined in the metadata.json of the appmodel. The value is set while designing the virtual application pattern. I also specified which package must be used during the deployment. A package contains a number of scripts that are send to the vm and run in a specific order. The scripts can be subdivided in roles (here ‘slave’). As the deployment engine use Java transformer to transform the application-model into a physical-model and we use a template we have to setup velocity to transform the template into java code. This is done via the MANIFEST.MF and an OSGI-INF file. The link to the application model is done via the name of the component (here:slave) which have to be the same as the ‘id’ attribute of the application model (metadata.json file). The link to the physical model is done via the ‘component.template’ property defining the location of the physical model template. Now we have to register this service in the plugin, this is done via the MANIFEST.MF by adding a service component. Multiple service components can be set by separating them with a ‘comma’ and again this was already done by the PDK. – Right-click and select ‘New’->’Plug-In Part’ and fill it as follow: then ‘New’->’Plug-In Role’ and fill it as follow: You can delete the directory ‘mynamelab.scripts’. First the install.py scripts will be launched, in this scripts we will ask to load the ‘scripts’ directory of the specific role and run it followed by the start.py. we can see here that the SlaveAttr1 will be printed in the log file. Now, we are ready for our final test, as the patterntype plugin has be already loaded, we need only to reload the plugin but with a new version number. For that you can increment the version attribute in the config.json and then relaunch the build.xml located in the plugin.depends project or You can also just build the individual plugin with its build.plugin.xml file, and load it from the plugin’s export directory. To upload the plugin, just go in the SCAWS portal, click on ‘cloud’->’System Plugins’, click ‘plus’ and load the *.tgz file located in the export directory of the plugin.mynameLab project. Now, you are ready to deploy your virtual application pattern based on your own pattern-type. Once deployed you can look at the logs and particularly at the role log where you will find an entry containing the ‘Attribute1″ value. NB: This video was done on an earlier version of the PDK, the plugin.depends doesn’t exist anymore. Knowing that I’m really comfortable with Eclipse environment and Java, I don’t have skills in python, I found the realization for this very simple scenario not difficult. It took me a week-end to create this scenario and I was really a novice in this area. Realization skills needed: Eclipse (+), Python (++), Velocity (+), Maestro library (+++), JSON (+). Of course, depending on the software you like to deploy on each virtual machine, you will need skilled people able to deploy in an automatic way the software and automate also its configuration. This entry was posted in IBM Cloud, IBM PureApplication System, IBM PureSystems, IBM SmartCloud Application Services, Video and tagged #ibmcloud, #ibmpuresystems, #puresystems, #SCAS, #SCAWS, #smartcloudenterprise by ITDoVe. Bookmark the permalink.